We met Master Chocolatier Fritz Knipschildt during his truffle class held at the The Clarke Culinary Center, the ultimate state-of-art kitchen resource center, home of culinary dreams with their inspired showrooms featuring stunning designs and top-end quality appliances. During our class, we learned that he was born and raised in Odense, located on Denmark's Funen Island, and it was here that young Fritz began his culinary career at age 13 working in a restaurant as a dishwasher filling in for his sister when she was ill. Enchanted with the restaurant ambience, and being precocious and passionate, it was not long before he worked his way up the culinary ladder learning by watching, resulting in the opportunity to take charge of a new bistro restaurant. What was rather unique is at that time, he had yet to go to culinary school. He continued to hone his culinary skills by training for 4 and ½ years at the Hotel and Restaurant School in Denmark, followed by working in France, Spain, and in the United States. In 1999, he was living in New York in a very small, one-bedroom apartment, however this did not deter his passion and his vision, and he started making chocolates out of his apartment and selling them to small retailers. Soon, his experimental style of combining savory spices with sweet won him notice and he started selling his products to larger prestigious retailers, and formed his company, Knipschildt Chocolatier, LLC. 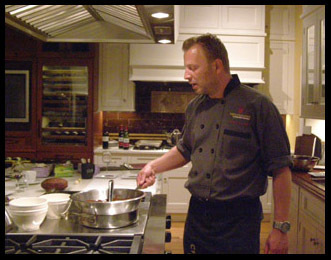 In 2005, he opened Chocopologie Café in Norwalk, Connecticut a delectable combination of a bistro and retail chocolate shop. Since opening, he has earned many prestigious culinary awards, and has appeared and competed on numerous culinary television shows including winning an episode of Throwdown with Bobby Flay. 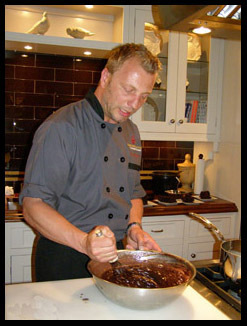 From his humble beginnings in an apartment, Master Chocolatier Fritz Knipschildt now has four locations in Connecticut, and in August 2013 will return to Denmark for several months to open a shop there. 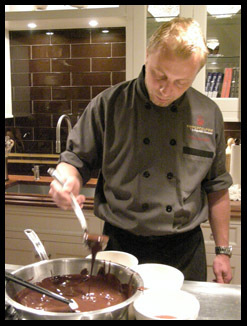 Master Chocolatier Fritz Knipschildt graciously shares his recipe for Dark Chocolate Truffles (Madeleine). Method: Boil the heavy cream and the sugar. Once the cream boils, pour it slowly over the chocolate while whisking. When the mixture reaches body temperature, add the butter, and whisk until well combined and smooth (this is the ganache). 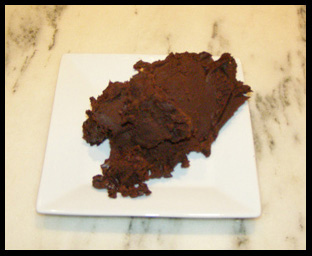 Set the ganache aside in a cool place (not in the refrigerator) until set, for approximately 6 hours. Cover the container tightly with plastic wrap and refrigerate for 1 hour. Then you can start rolling the ganache in small balls and place them in the refrigerator for approximately 20 minutes. In the meantime, melt the 8.8 ounces (250 grams) of dark chocolate and cool it down until it reaches body temperature. Wear plastic gloves and dip the ganache ball in the melted chocolate shaking off the excess chocolate, then roll the truffles in the cocoa powder shaking off any excess powder. Allow to set 5 to 10 minutes. Serve and enjoy! Chocopologie by House of Knipschildt has four locations in Connecticut: Chocopologie Sono, 12 South Main Street, South Norwalk, Sono Marketplace, 314 Wilson Avenue, South Norwalk, Chocopologie NH, 47 High Street, New Haven, and Chocopologie Stamford, 213 Main Street, Stamford. In addition to onsite or online purchases at www.Knipschildt.com, the chocolates are also available at retail partners: Whole Foods Market, Balducci's, and The Chocolate Room. For information on Chocopologie by House of Knipschildt and Chocopologie Café, as well as upcoming events and classes, please visit: www.Knipschildt.com. Read about the Chocopologie class at The Clarke Culinary Center in the Gastronomy section. For information on The Clarke Culinary Center, or to register for classes, please visit: www.ClarkeCulinaryCenter.com. © August 2013. Luxury Experience. www.LuxuryExperience.com. All rights reserved.